The rise of the Isthmus of Panama created the conditions with which to test hypotheses considering the causes and consequences of adaptive radiation and speciation of terrestrial, freshwater and marine species. The rise of the isthmus first led to an important paleozoogeographic event called the “Great American Interchange” characterized by the migration of terrestrial and freshwater fauna between South American and North American ecozones. In addition, the Isthmus of Panama isolated reproductive populations of marine species across taxa that allowed the speciation and adaptive radiation of geminate, or sister, species on either side of the isthmus to different biotic and abiotic conditions in the western Atlantic and eastern Pacific environments. The evolution of Atlantic and Pacific sister species has also been the subject of decades worth of research that has measured rates of evolutionary change on the molecular level by calibrating the molecular clock with the geologic data on the dates of the rise of the isthmus of Panama, which is thought to have occurred about 3.5 million years ago, although this hypothesis is now contested, as an alternative, but not conclusive, date of approximately 18-20 million years has been proposed for the rise of the isthmus. Nevertheless, the rise of the isthmus has permitted one of the most important and extensively studied natural experiments in evolution, a natural experiment that now allows scientists to test specific predictions considering the ecological and evolutionary dynamics that have allowed species to adapt to the biotic and abiotic conditions in different environments. Adaptation to different environment conditions can impose differential selection pressures on reproductively isolated populations. Therefore, we should predict that physiological and behavioral traits should confer adaptive value to the different conditions found in the coastal marine environments of Panama. 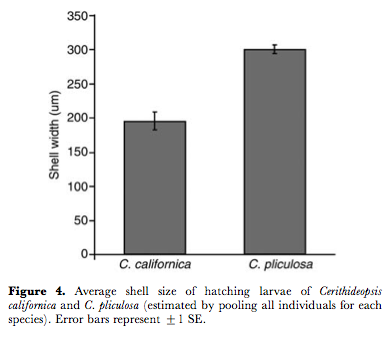 We have recently tested the effects of adaptive radiation to different environmental conditions of the Pacific and Atlantic Oceans on the strategies of larval development in two geminate species of coastal mud snails (Potamididae) across the Isthmus of Panama, Cerithideopsis californica on the Pacific coast and C. pliculosa on the Atlantic. Differences in the productivity of western Atlantic and eastern Pacific coastal environments in this region allowed us to predict that in an environment of relatively low productivity (the Atlantic), natural selection will favor the evolution of larval developmental strategies that allow it to survive in these environments of low productivity through increased maternal investment and reduced larval duration in development. This pattern of larval development is consistent with models of life-history evolution in which increased maternal investment is selected for in low-productivity environments. 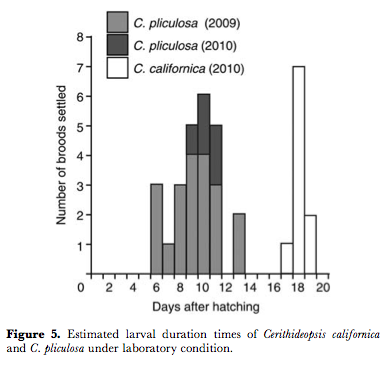 In this case, we observed larger size and reduced planktonic duration of larvae in the Atlantic than in a relatively highly productive environment (the Pacific). While geminate sister species pairs across taxa that inhabit the Pacific and Atlantic coasts of Panama are excellent systems with with to study adaptive radiation to different environments, this pair of snail species is an especially important system with chih to study the drivers of life-history evolution because both species have an exceptionally broad biogeographical distribution, spanning over 30 degrees latitude on both the Atlantic and Pacific coasts. Both of these species are found in habitats with different abiotic and biotic conditions, such as food availability, salinity and temperature that change with increasing latitude that can thus impose differential selection on larval and adult snails that can drive the evolution of important life-history traits, as was observed in the study considering larval developmental strategies across the Atlantic and Pacific coasts of Panama. Testing whether differences in life history traits of Atlantic and Pacific snails across their latitudinal range is an evolutionary or plastic response to different environments, however, is a whole different story. Write on! Email me at victor.frankel@mail.mcgill.ca for a copy of the PDF.